Superior Source CoEnzyme Q-10 appears to have a connection to the support of healthy heart function among other possible protective and regulatory functions. This CoEnzyme Q-10 Plus formula with B-6, B-12, folic acid, and selenium is specifically formulated to provide the maximum essential nutrients for the support of the heart. - Selenium helps to protect the body from cell damage due to free radicals. - Folic Acid promotes the production and maintenance of new cells and supports nervous system health, energy metabolism, and healthy heart function. 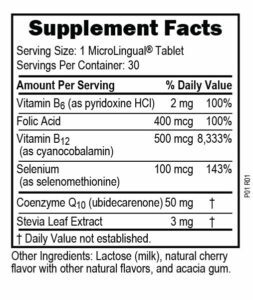 Suggested Use: As a dietary supplement, dissolve one MicroLingual® tablet under the tongue daily. May also be swallowed as you would a regular tablet. Disclaimer: "These statements have not been evaluated by the Food and Drug Administration. These products are not intended to diagnose, treat, cure, or prevent any disease"